For singer/songwriters who play acoustic guitar, it’s a competitive, crowded world out there. The VE-8 Acoustic Singer delivers that extra edge you need to stand out and shine, supporting you with professional BOSS sound every time you perform. 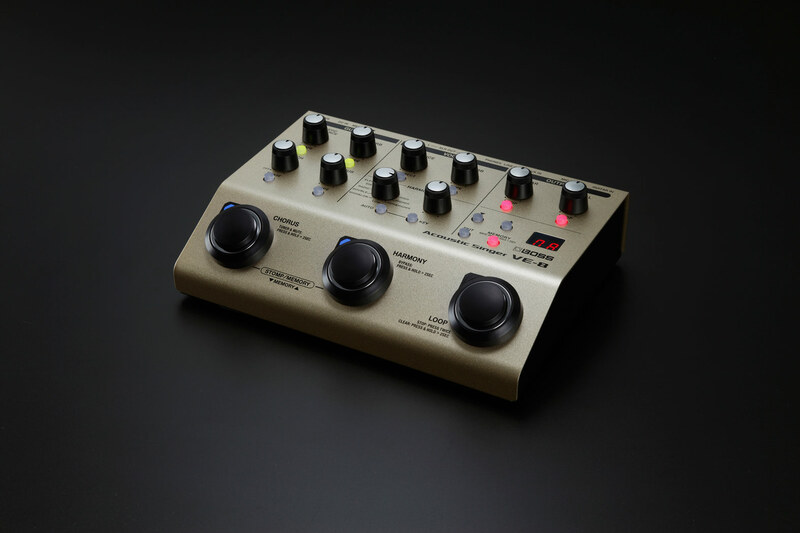 Simple to use, the VE-8 provides studio-quality voice and guitar processing plus impressive real-time harmonies and looping in one compact, go-everywhere package. With such great sound and powerful creative features at your command, you’re destined to bring down the house everywhere you play. 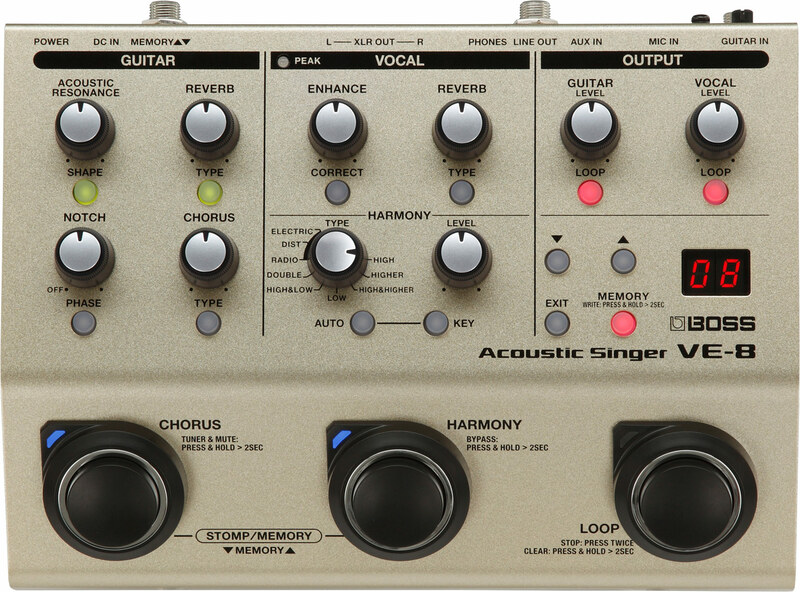 The VE-8 makes it easy to get professional, studio-level vocal sounds right away. Just plug your mic into the XLR input and dial up some nice ambience, add clarity and control with the Enhance feature, and more. You can even call up hard-tuned electronic voice sounds, distortion, and radio voice tones to bring some modern edge to your acoustic performances. With the VE-8’s dedicated guitar channel, your acoustic axe will sound just as great as your vocals. Acoustic Resonance magically restores your natural guitar sound, eliminating the sterile piezo “quack” that plagues typical undersaddle pickups used in plugged-in acoustics. Reverb and chorus are on hand too, plus cool BOSS effects like Octave, Mod Delay, and more. There’s a built-in tuner as well, a must-have tool for stage performing. And with the phase switch and notch filter, you have fingertip access for killing any feedback issues the instant they arise. In a solo performance, the ability to create natural vocal harmonies turns heads and elevates your tunes to new sonic levels. Using the VE-8, creating these harmonies live has never been easier. The automatic harmony function detects the chords and key you play with your guitar, and then generates the correct harmony as you sing. Hybrid and fixed harmony modes are available too, giving you all types of versatility for different performing and recording situations. There’s also a nice vocal doubling effect, a useful feature for adding fullness and presence to your voice as needed. 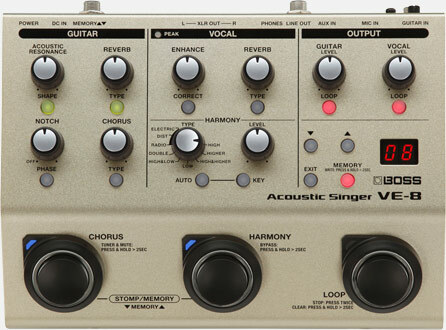 The specially designed looper in the VE-8 sounds great and is ready to support your performance whenever you need it. 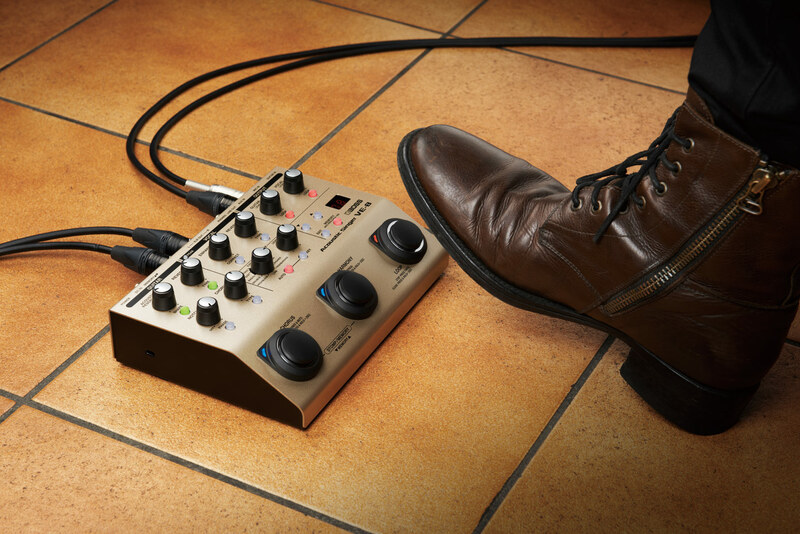 Just use the dedicated footswitch to lay down a percussive rhythm, chord progression, vocal counterpoint, or whatever you like. You can easily select your guitar, voice, or both for looping via panel buttons or an optional footswitch. The VE-8’s rear panel has a guitar input and XLR mic input with switchable phantom power, plus an Aux input to connect a smartphone or other device for backing music. Stereo XLR balanced outputs provide a direct feed to the house PA, while stereo 1/4-inch outputs let you send a separate signal to stage monitors or an acoustic amp. Both the vocal and guitar channels feature a three-band EQ and low-cut filter for shaping the tone to suit the venue, and it’s even possible to send the two channels to separate outputs for external mixing flexibility. 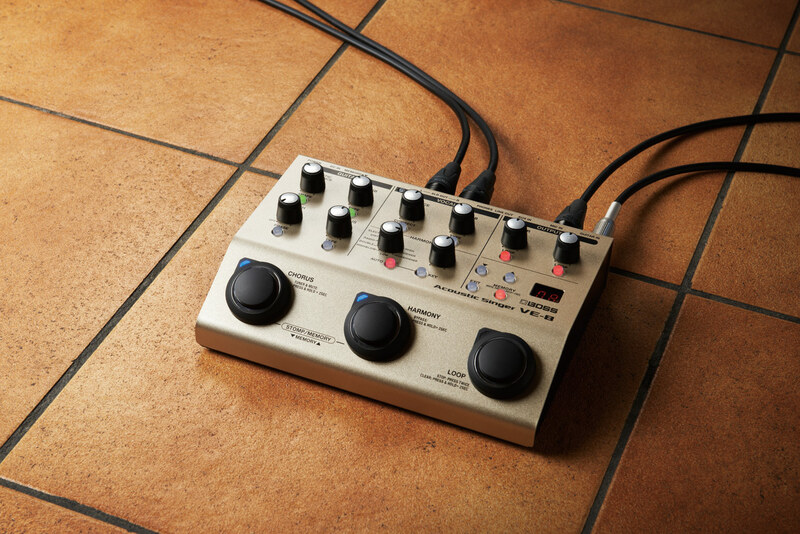 And via USB, you can use the VE-8 as a direct recording interface with your favorite DAW software. With the VE-8’s grab-and-go panel controls, it’s simple to dial in sounds and settings as you play. After creating a setup you like for a particular song, just save it in one of 50 memory locations for instant recall while performing. 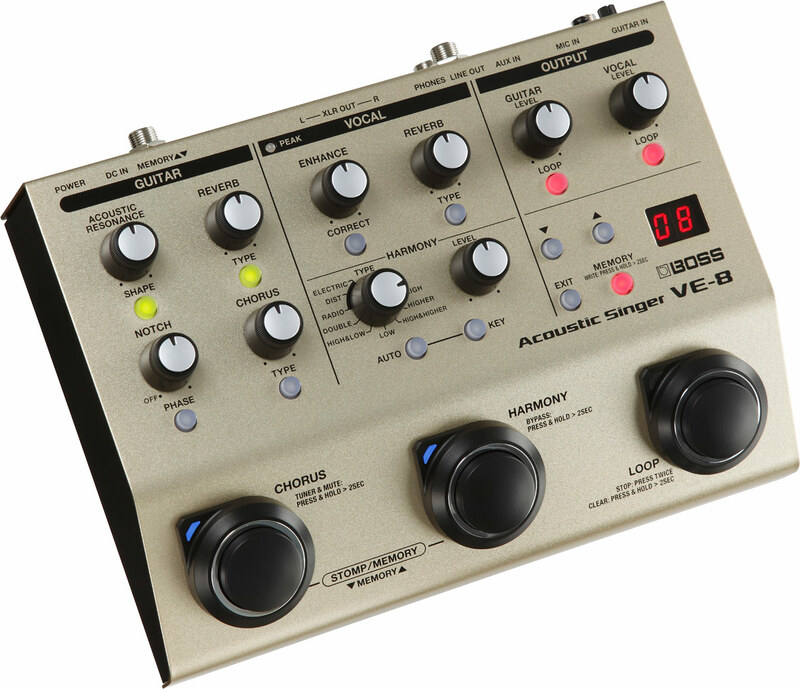 The VE-8’s three built-in footswitches control a variety of live functions, and one or more optional footswitches can be connected for further control if needed. Click any image below to view the full-size image. VE-8 Driver Ver.1.0.0 for Windows 10 This contains information on the VE-8 driver compatible with Microsoft Windows 10. VE-8 Driver Ver.1.0.0 for Windows This is the VE-8 driver for Microsoft Windows 8.1 / 8 / 7. VE-8 Driver Ver.1.0.0 for Mac OS X This is the VE-8 driver for OS X 10.9 / OS X 10.10 / OS X 10.11.